Cooking may seem like a monotonous chore involving a small amount of skill to get through with daily living. In today’s society, most people look for the fastest way to prepare ordinary dishes. A simple cookbook or family recipe introduces a little variety, but it rarely gets beyond cooking basics. When people specialize in food preparation, it becomes a work of art that aims for salivary satisfaction. Many people refer to this type of cooking as the culinary arts. The culinary arts encompass a wide array of fields that have to do with food preparation and other duties related to cooking. Chefs and cooks specialize in the culinary arts, with many who can do more than create the occasional good meal. In fact, most have learned how to plan meals, menus, and manage kitchens. Chefs and cooks receive their training either in restaurants or culinary schools. Chefs can eventually take on greater responsibilities with enough experience, such as ordering inventory, staffing cooking stations, and fulfilling orders. Before the creation of culinary schools, professional cooks acted as the teachers for apprentices who wanted to learn the tricks of the trade. The Boston Cooking School became the first culinary arts school to teach formal instruction in a classroom setting. 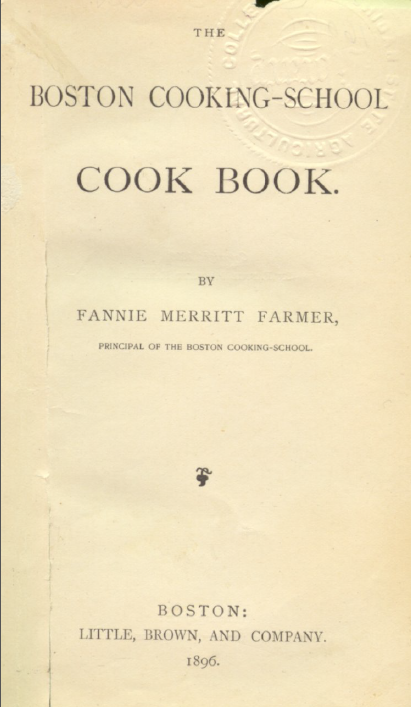 Fannie Farmer, an American culinary expert, attended the school as a student before becoming the instructor and principal of the school in 1877. In 1896, Farmer published the Boston Cooking School Cookbook, a textbook that introduced the importance of using exact measurements while cooking. Her published material laid the groundwork for culinary instructional material. In 1929, the American Culinary Federation formed as an intermediary for students seeking education and training in the culinary arts. The founding of the federation also led to the assemblage of the United States Chef Club. The American Culinary Federation continues to assist students in leading their educational path through apprenticeships and certifications. A surge of students became interested in the culinary arts after the post-war era due to a booming economy. This led to the widespread availability of culinary arts instruction to massive audiences. In 1946, James Beard shifted his focus to the television screen to reach his audience. A handful of brick-and-mortar schools emerged from this point onward. For instance, Yale University opened the New Haven Restaurant Institute, also known as the Culinary Institute of America, in 1946. The school relocated to Hyde Park, New York and opened an additional campus in California. In 1973, Johnson and Wales University opened its College of Culinary Arts. In 1976, the American Culinary Federation Educational Institute coordinated apprenticeships with the aid of a government grant. It continues to assist culinary students with the opportunity to learn the trade with paid on-the-job training. Today, a host of educational opportunities exist for students looking to gain the necessary experience to work competently in the field. 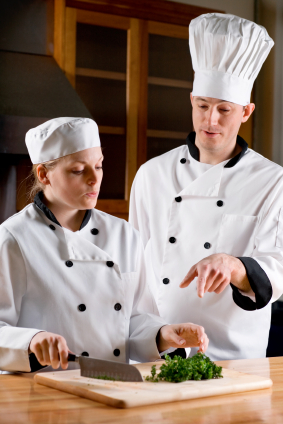 The majority of chefs and cooks learn their skills while on the job. Others have chosen a formal path of education and training at a culinary arts school, community college, technical school, or four-year university. A few have learned through apprenticeship programs or the armed forces. Culinary programs at any of these educational institutions allow students to practice their cooking skills under supervised instruction. Culinary programs cover all aspects of working in the kitchen, including menu planning, food sanitation, purchasing inventory, and staffing cooking stations. Most culinary programs require students to gain experience through an internship or apprenticeship. Apprenticeship programs offered by professional culinary institutes, trade unions and industry associations provide paid on-the-job training for students looking to hone their skills. The majority of apprenticeship programs last about two years. Students enrolled in an apprenticeship program learn in a classroom setting and work environment. The American Culinary Federation accredits more than two hundred training programs and sponsors apprenticeships across the nation. Some students have chosen mentorship programs that work similar to apprenticeships, except they work under the direct supervision of experienced chefs. In addition, members of the armed forces who served as chefs or cooks often receive formal training while enrolled. Students who learn in restaurant settings without formal training can obtain certifications to prove their competency in the field. Prospective students need to possess certain qualities before pursuing the culinary arts. While formal training instills and reinforces these qualities, students must possess the tenacity to continue with it in the workforce. The culinary arts involve more than having good cooking skills. It requires having good business skills, time management skills, leadership skills, manual dexterity, and creativity. A keen sense of smell also ranks high as a necessary skill to becoming a competent chef or cook. Chefs and cooks who show a high level of competency in their field may have plenty of opportunities presented to them for advancement in the field. Many people would be surprised to discover that some types of fats are actually a nutrient and are good for the body. Referred to as lipids, fats can be either solid or liquid depending on the type. They are compounds that are made up of hydrogen, carbon, and oxygen, and are found in animal tissue and plants. On their own, fats are not bad for the body, in fact they are necessary. There are, however, problems with certain kinds of fat. When a person eats too much of the wrong types of fat they can develop health problems such as increased cholesterol, type II diabetes, heart disease and even cancer. Understanding fat will help people understand how it can be both beneficial and problematic. As a result, it will also help people to make healthier choices in their food choices. Fats are a necessary nutrient that the body needs. It is crucial in helping the body function as it should. One of the reasons why fats are important is that they are an efficient source of energy for body. It also helps the body absorb important vitamins, such as Vitamins A, D, and E. Fats are important for brain function and healthy cells. Organs in the body are protected by fat, which acts as a protective cushion. Skin also benefits from fat which gives it a healthier appearance and helps it to better insulate the body. When discussing fats, there are different types to be aware of. This includes the fat that the human body makes as a result of consuming too many calories and dietary fats. Dietary fats may be broken down into two groups – fats that are harmful and fats that are healthy. There are two types of harmful fats, which are saturated fats and trans fats. Both come from animal-based foods and are often solids. With saturated fats, there is the increased risk of elevated blood and LDL cholesterol levels. While it raises what is called your bad cholesterol levels, it lowers your “good” cholesterol levels. Consumption of saturated fats may lead to type II diabetes or cardiovascular disease. Unlike saturated fats, a majority of trans fats are created. This is done during a process that makes liquid oils more solid by adding hydrogen. This type of fat may elevate a person’s risk of heart disease. Trans fats are often labeled as partially hydrogenated oils. Fried foods are an example of trans fats and also saturated fats. Butter, fatty beef, whole milk, and pork also contain saturated fats. The second group is healthy fats, which includes monounsaturated fats and polyunsaturated fats. Foods containing monounsaturated fats have a number of potential health benefits, such as helping to control blood sugar, improving blood cholesterol levels and reducing the risk of heart disease. Avocados, peanut butter, and oils, such as olive oil and sunflower oil, contain this type of fat. Plant-based foods are the primary source of polyunsaturated fats. Eating foods that contain this type of fat may improve one’s blood cholesterol, reduce the risk of coronary artery disease, and lower blood pressure. Vegetable oils are a source of polyunsaturated fats as are fish that are high in fats, such as mackerel, trout, or salmon. Omega – 3 fatty acids are polyunsaturated fats. Healthy fats are often liquid when at room temperature, but solidify at cooler temperatures. Fats are relatively high in calories and should be used in moderation. This includes the healthy fats. Despite their benefits, they contain the same amount of calories as unhealthy fats. Across the board, every fat gram has nine calories. The overconsumption of calories leads to a build-up of body fat, which may lead to obesity, type II diabetes, or other health problems. Healthy fats should be included as a part of a healthy diet; however, due to the number of calories per gram, people should be aware of exactly how much is in their daily diet. Less than 30 percent of one’s daily calories should come from fat, with less than ten percent from saturated fats, ten percent or less from polyunsaturated fats, and between ten and fifteen percent from monounsaturated fats. 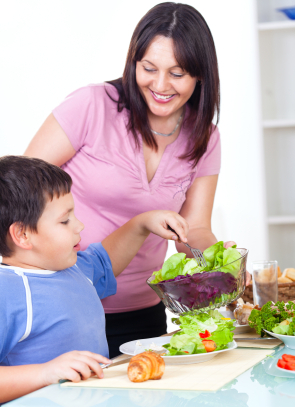 Diets should consist of fish, lean meats and poultry, as well as fresh fruits, vegetables and whole grains. Dairy products should be fat-free or low-fat. When reading labels in grocery store, caution should be used when labels read “0 Trans Fats” or if there is a claim that the food is “Trans fat-free.” Often these food items will be high in saturated fats and are not as healthy as the label implies. Fats are a necessary nutrient that provides numerous benefits to the human body. The key to healthfully including fats in one’s diet is to understand what is both good and bad about them. This includes knowing which fats to avoid and which fats are actually healthy. 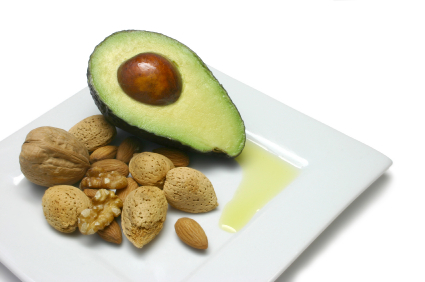 Even healthy fats, however, should be included with care in one’s diet. For low-fat recipes, please see the following links.